Speed walking is a simple way to burn fat from your entire body, including your thighs. While a leisurely stroll may not impact your body to deliver the best fitness results, speed walking uses a greater intensity to burn more calories. Speed walking can also help to increase your metabolism, allowing you to continue to burn calories far after your walk is over. Slimming your thighs can be achieved with speed walking. Speed walking uses the quadriceps, hamstrings and glutes more effectively than leisurely walking because of the increased stride used to amp up your walk. Knee flexion and extension are both used more powerfully with a faster speed allowing the quadriceps and hamstrings be activated. Speed walking can also increase your lean muscle mass, boosting your metabolism and allowing you to burn more calories efficiently, according to MayoClinic.com. The only way to lose weight is to burn more calories than you consume each day, creating a caloric deficit. While you can not spot reduce -- meaning just burning fat from one area -- you can lose fat from all over your body, including your legs, by reaching a caloric deficit. To lose 1 lb. of fat, you must burn 3,500 calories. According to the HealthStatus website, a 150-lb. person burns 159 calories walking at a 2 mph speed for an hour, while the same person burns 351 calories walking at a 4 mph speed. Increase your results by walking consistently. The American College of Sports Medicine promotes completing aerobic activity daily for 60 minutes when trying to alter your body composition. Adding an incline, either by finding a hill or inclining your treadmill, forces more effort to be placed on the legs, allowing you to tone your muscles. Focus on maintaining your speed as you propel yourself up the hill. The speed combined with the increased resistance of the hill places a greater emphasis on your hamstrings and glutes. Adding variety to your walks can also help your chances at slimming your thighs. 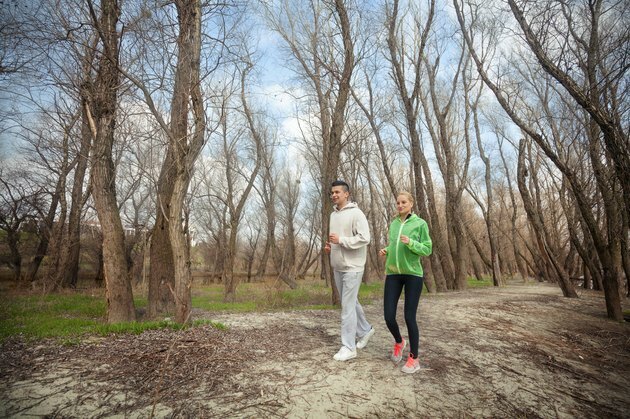 During your walk, focus on building strength in your legs by adding squats or lunges into your routine. For example, speed walk for five minutes followed by 25 lunges and 25 squats. Repeat this circuit during the duration of your walk to put a greater demand on your lower body. Focus also on the fuel you put into your body. Choose lean meats, whole grains, fruits, vegetables and nuts to keep you feeling full and preventing overeating, which can halt your weight loss.